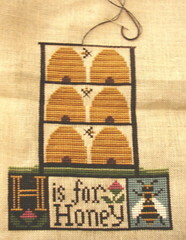 H is for Honey - I got all the beehives done! 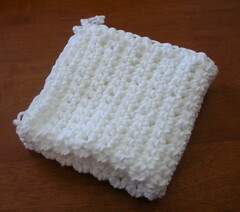 A crocheted dishcloth - took no time at all! The above photo is a Debbie Bliss baby sweater I started knitting today. It's the Cardigan with Fully Fashioned Shaping from the Baby Knits for Beginners book. I'm using Cascade Sierra - the yarn I was using for a scarf I know I'll never finish. I think both of the names are nice. You still have 7.5weeks to ponder his name. Love your progress on H is for honey! I like Maddox best, only because I get tired of hearing our nephew called "Matt"
I love that PS design. I have the chart and it is one that I want to stitch for sure. How are you going to finish it?